Friends, it’s been a shitstick of a week so far (meh, bound to happen sometimes, right?). But rather than dwell on the negative, I decided instead to dwell on the ugly: moving backyard plants before they start budding again for spring. Ha! While that doesn’t sound like much of an improvement, and honestly probably won’t even look like much of one until spring and summer rolls around, I decided to make a few changes in the back yard in preparation for the eventual upgrades I’m planning later this year. Those of you who have been following along might recall that a few summers ago, I let bugs fall down my bra tore out a ton of overgrown ivy that had been plaguing my trees since moving into the house. I started to beautify things a bit with my gardenia garden beds along the long-forgotten fence on the right side of the yard (owned by my neighbor, so I didn’t really want to deal with the expense of replacing it, but I did want to make it look more appealing from my side. I think I’ll probably tack up a few replacement boards on the really broken parts this summer. I have some leftover pieces from my own fence building project so it’ll be a free upgrade!). The majority of the filler came from the ground-out stumps that had been left in a large mound where the trees used to be. 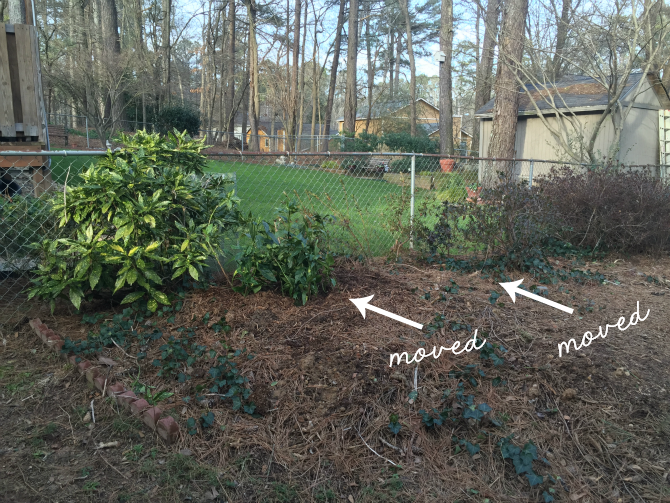 But, there was still another project I knew I’d need to get to before it warms up again: moving the azaleas, roses, and rhododendrons from a now-awkward placement (sitting next to nothing) and placing them next to the fence. When the trees were there, it was less of a problem. These plants (I assume) were a part of a more elaborate elevated area that the previous owner had planted around each tree. It had long since overgrown by the time I moved in, but I didn’t mind quite so much when things were in bloom! 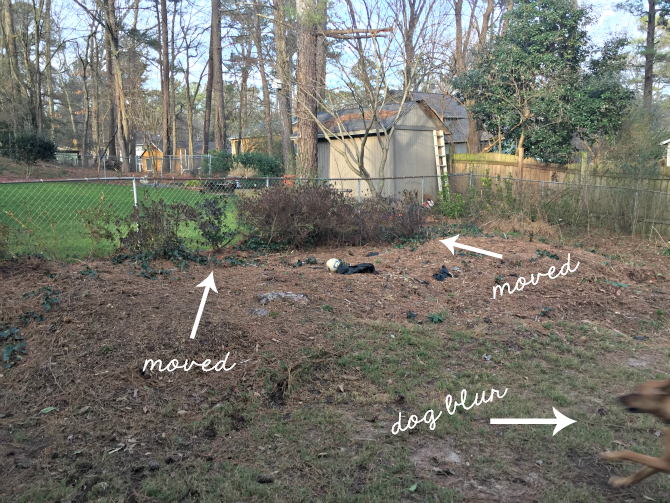 Between the crush of the tree removal and Charlie’s snarls with the leash, the battered and tattered plants were looking pretty bleak by this point (but they had survived a lot already, so I’m confident they were at least okay enough to try to replant). Since the roses had finished blooming and the azaleas weren’t due to bud until closer to spring, each plant was unearthed, divided (to create multiple plants out of the bigger bushes), and planted separately along the fence line until they start thriving again. Online forums told me not to fertilize them during winter, but I think I might do some light-handed feeding just because of the shock from moving them. If you are meaning to move plants of your own, do some quick Googling to find out the best period of time to move each plant. Typically, it’s during dormant months (as in, not blooming or getting ready to bloom). Here’s some general info I found helpful, and you can look up charts like this for your climate zone. It’s not a permanent placement necessarily, but having them out of the way frees up nearly the entire mound of soil that they were all sitting on top of, which will make room for moving all of that soil toward the back of my yard to help fill up the sink hole. I know it won’t be enough soil by itself (I’ll probably have to buy some fill dirt and rent a mini excavator too — fun! ), but it will go a long way toward leveling out all of that square footage. But that’s for another day when it’s not quite as cold outside. And then: some badass building plans can begin! Growing up, my dog (a shepherd collie mix) was able to jump our fence too, so my parents got some chicken wire and attached it to the top of the fence to keep her in. It wasn’t the most attractive solution, but it at least gave her free range over the backyard without everyone having to worry. Not sure if that’s an option for you, but something to consider! I’ve considered options like chicken wire, but I think my neighbors would object to me attaching it to their fence. And I know I’ll hate the way it looks… shame the things that work well are often that way! OH once Spring comes and everything starts blooming you will love having these moved along the fence line and out of your way. Glad to see you didn’t throw them out. They really are beautiful! Haha yeah, once spring comes I’ll have clusters of colors and go “hmm… didn’t expect it to look like that,” but it will give me a better idea of where to place them as a final spot. And I had to keep them… they have been SO hardy through all of the neglect and abuse (cough cough, smashing ’em with a tree) that I figured they could sprout new roots and I could replant them when the time was right again! 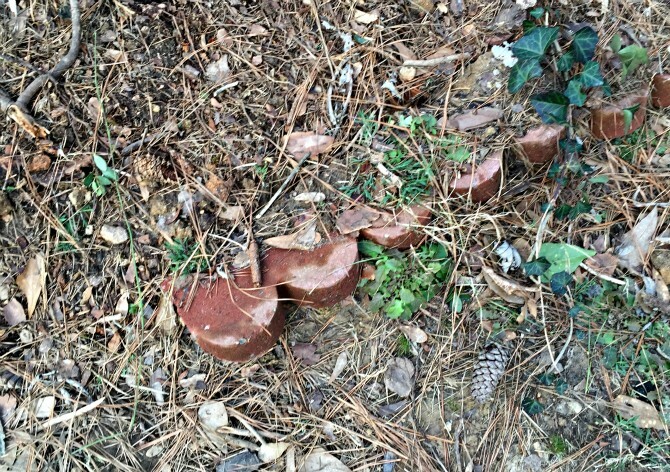 Totally unsolicited advice here, but I use a root starter liquid on everything I’ve ever planted or transplanted, and I’ve never had something die or not ‘take’ when I used it. When you are planting, you pour it on the root ball directly. But then at the next watering, mix some in with the water. Make sure you dilute it in each case according to the directions. I’m not scientific enough to know if my use of root starter is what does the trick, or if I’m just lucky in general and everything grows well on its own. But I felt obligated to comment about it. Pardon me if I’m being obnoxious. Not at all! I have some root starter in my garage and it really didn’t even occur to me to grab it when I was transplanting them. Good idea! I love seeing landscape transformations. When all of this is done, you should compile a progress gallery! 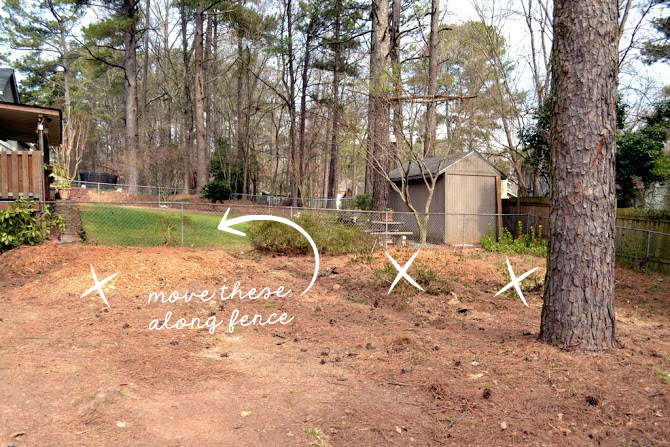 The process takes so long that when you get to the end, you forget some of the best parts (like when my husband backed the excavator into a line of potted saplings, and broke the new fence. Hey can we get some more pics of your neighbors yard… over there? JK! Have a better weekend! Haha, I know, his is SO much nicer than mine! Someday, fingers crossed, mine won’t be as much of an embarrassment. Have you ever thought about an electronic fence and collar? If you don’t feel like burying a wire, there are wireless ones that transmit to a certain range. I’ve had the wired ones and a friend of mine has the wireless one and both are effective at containment. I’ve also used an anti-jump harness with varying degrees of success. Much better options than fiddling with a leash all the time. 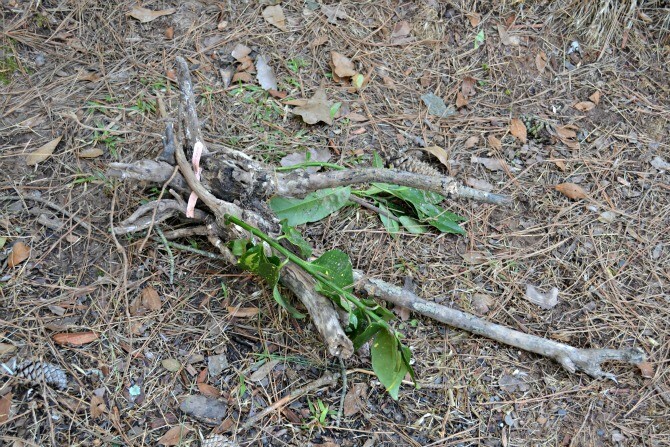 One wrong tangle could be devastating. Tried it, didn’t work for her. Multiple attempts at training and the other dogs in neighboring fences have proven to be too distracting. There is always some risk in leashing (as a natural worrisome dog-mom, I’ve thought about it a lot), but she’s never leashed when I’m not around and it’s the option that allows her the most range around the yard without the bigger risk of her getting loose and possibly hit by a car (I live in a neighborhood, but toward the entrance). Great alternative for those who would like to try it, so thank you for suggesting it!